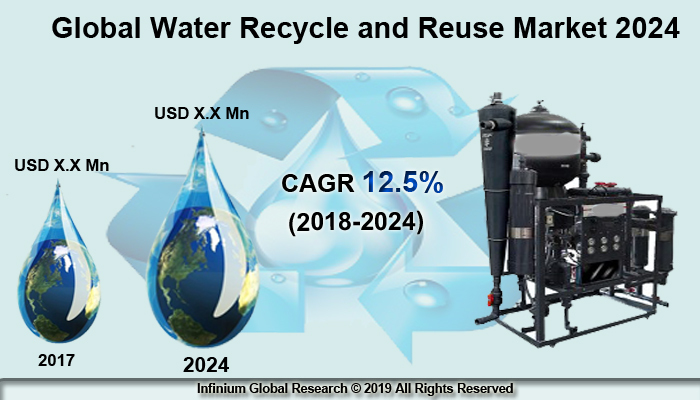 A recent report published by Infinium Global Research on water recycle and reuse market provides in-depth analysis of segments and sub-segments in the global as well as regional water recycle and reuse market. The study also highlights the impact of drivers, restraints, and macro indicators on the global and regional water recycle and reuse market over the short term as well as long term. The report is a comprehensive presentation of trends, forecast and dollar values of global water recycle and reuse market. According to the report, the global water recycles and reuse market is projected to grow at a CAGR of 12.5% over the forecast period of 2018-2024. Water recycling is reprocessing or reuse of treated wastewater for beneficial purposes such as landscape irrigation, public parks, power plants, and industrial processes. Other non-potable application includes cooling water for power plants and oil refineries. Recycled water can satisfy water demands if the quality of water is suitable for use. Water recycling offers tremendous environmental benefits. Water recycling is helpful to decrease the diversion of water from sensitive ecosystems by providing an additional source of water. Further, benefits offered by recycled water include decreasing wastewater discharges and reduction in pollution. Water recycling can be cost-effective in the long term as compared to water supply alternatives such as ground water or imported water. Use of recycled water for non-potable purposes in power plants, public parks, landscapes drives the growth of water to recycle and reuse market. Furthermore, environmental benefits offered by water recycling such as decrease diversion of freshwater from sensitive ecosystems and recycling can reduce and prevent pollution that in turn boosts the growth of water recycle and reuse market. Water recycling, along with water conservation is helping to preserve and sustainably manage vital water resources that fuels the growth of water recycle and reuse market. Moreover, water recycling plays a greater role in the overall water supply system owing to growing environmental needs and water demands. Use of wastewater in industrial purposes propels the growth of water recycle and reuse market. However, health risks by inadequately treated wastewater such as consuming raw vegetables that are irrigated with recycled water may hinder the water recycle and reuse market. Low cost of water recycling process compared to alternatives such as the extraction process is expected to provide beneficial opportunities for water recycle and reuse market. North America dominates, the water recycles and reuse market. In the U.S., the use of recycled water is increasing in order to meet the needs of the environment and growing water supply demands. In addition, technological advancements in water recycle process fuels the growth of the water recycle and reuse market in the region. The Asia Pacific has expected top hold second largest region owing to government initiatives. The report on global water recycle and reuse market covers segments such as technology, and application. On the basis of technology, the sub-markets include biological treatment technology, chemical treatment technology, physical treatment technology, and others. On the basis of application, the sub-markets include agrochemical, commercial, industrial, and others. The report provides profiles of the companies in the market such as Hitachi, Ltd., Nexus eWater, Phoenix SourceWater Inc, Evoqua Water Technologies LLC., Sourcewater, Inc., Reclaim Equipment Company, SUEZ Water Technologies & Solutions, Melbourne Water, Hyflux Ltd., Rivergreen Water Recycling, LLC, and Veolia Environnement S.A. The report provides deep insights into the demand forecasts, market trends, and micro and macro indicators. In addition, this report provides insights into the factors that are driving and restraining the growth in this market. Moreover, The IGR-Growth Matrix analysis given in the report brings an insight into the investment areas that existing or new market players can consider. The report provides insights into the market using analytical tools such as Porter's five forces analysis and DRO analysis of water recycle and reuse market. Moreover, the study highlights current market trends and provides forecast from 2018-2024. We also have highlighted future trends in the market that will affect the demand during the forecast period. Moreover, the competitive analysis given in each regional market brings an insight into the market share of the leading players.